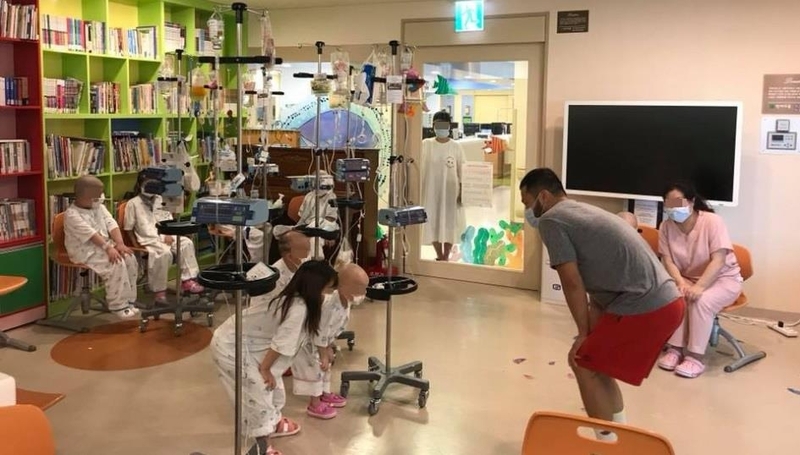 SEOUL, Oct. 3 (Yonhap) -- Mixed martial arts fighter Kim Hyung-su can't forget a bald-headed, 11-year-old boy with leukemia who played happily with him, despite having suffered from high fevers for days, during a weekly sports class at a Seoul hospital. "His parents told me that their son looked forward to the class so badly that he insisted on coming despite the fevers," Kim said in an interview with Yonhap. "He looked sick, but played well with us. That made me think that I shouldn't stop this no matter what happens." For more than eight years, Kim, 30, has been running the sports class for child cancer patients at Seoul St. Mary's Hospital every Saturday morning. He's recently added a similar, monthly program for patients at Seoul National University Hospital. "It's called a sports class, but it's not like professional exercises. It's basically me playing with the children," Kim said. "I wanted to give them some fun and get them to think positively. It may be helpful for their treatment because good hormones are released if we have fun and laugh." 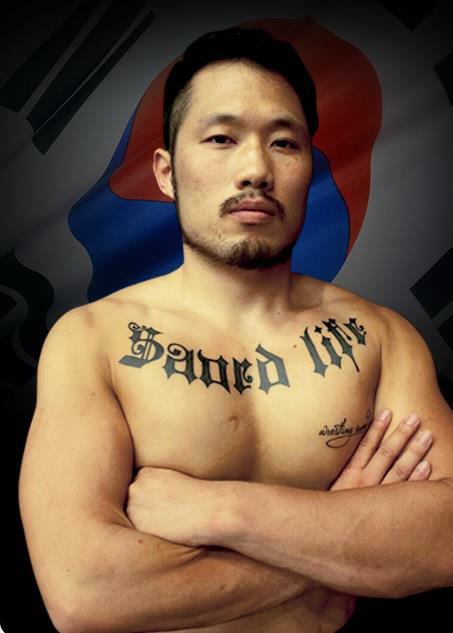 Kim, a sturdy former wrestler and now fighter of Road FC, South Korea's biggest mixed martial arts (MMA) promotion, with a record of six bouts, four wins, one tie and one loss, knows what it's like to be a leukemia patient because he grappled with the disease until he received a bone marrow transplant 10 years ago. Kim was first diagnosed with aplastic anemia when he was a first grader. 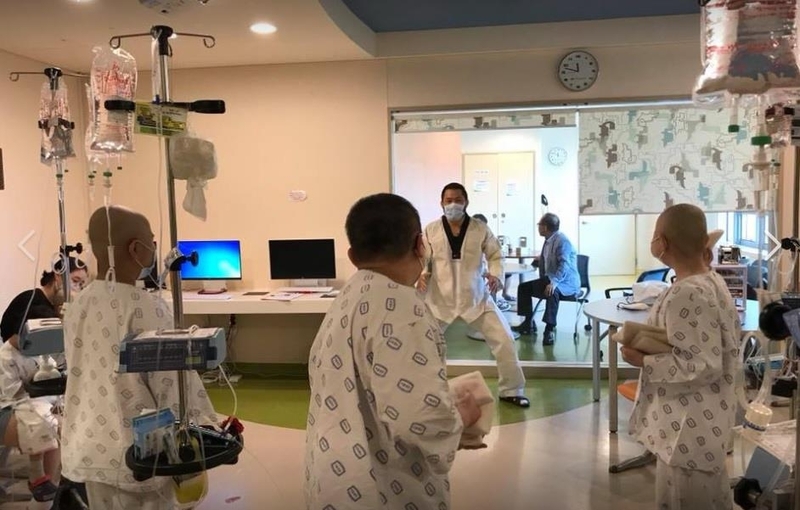 After immunotherapy treatment, he recovered and even joined the school's team of "ssireum," traditional Korean wrestling, when he was in fifth grade. As Kim showed talent at ssireum, he was scouted by a middle school wrestling team. Since then, he came to like wresting so much that he put his all into the sport, winning twice in nationwide competitions through his high school years. It was when he was 18 that the long-dormant disease attacked him again. "I asked my doctor the odds of curing the disease and he said 50:50," Kim said. "So I told him that I would rather die on the wrestling mats, and left the hospital." His condition later seriously deteriorated, but he was lucky enough to find a bone marrow donor, a woman from Taiwan, through an international network of donor registries. With the help of the Korean Association for Children with Leukemia and Cancer, Kim received the transplant and the disease was completely cured. Seoul St. Mary's Hospital is where Kim was treated. He has an English-language tattoo, reading "Saved Life," on his upper chest, with a smaller line, reading "Wrestling saved my life," inscribed below it. After all those hardships, including having to abandon wrestling, Kim said he felt a sense of emptiness, which was when he thought of offering volunteer service at the hospital where he was treated to pay back the help he received. While working as a wrestling coach at an MMA gym and as a Road FC fighter, Kim offered to give a sports class for child cancer patients at the hospital once every other week. The hospital agreed and he later increased the frequency of the class to once a week. The hour-long class usually involves stretching and fun activities, such as toy bowling, and children throwing soft objects toward a dodging Kim wearing a taekwondo uniform plastered with hook-and-loop fasteners. The children score points when they stick the objects to the velcro tapes. The hospital's child cancer ward has about 60 patients, and Kim's class is usually attended by as many as 15 and as few as four, he said. Kim has set up a charity foundation named Generous Tree to continue to expand the volunteer service. About 40 people have come forward to help him, with some joining him in his hospital visits, he said. "I wouldn't have been able to do this for this long if I did this for money," Kim said. "It's hard to get up early on Saturday morning. But when I get there and see children waiting for me, I come to regret having thought, even briefly, this is difficult. On the way back home after sweating with the children, I feel like I've made a big fortune. That is how I keep doing this."